Looking for a super crispy fritters snack that goes well with evening tea/coffee? Here goes the irresistably delicious best South Indian snack Onion pakoda. This crispy & spicy snack is very easy to prepare in just 5 to 10 mins. Adding crushed garlic really makes this snack flavorful & tempting. In this recipe, sliced onions are mixed with besan flour, rice flour and aromatic spices and then deep fried until crispy & golden. Try this very popular snack in your home with this easy video recipe. In a mixing bowl, add sliced onions, green chilly, curry leaves and mix. Add crushed garlic pods, broken cashewnuts and combine. Add butter, besan flour, rice flour, hing, salt and red chilly pwd. Cover it with lid and let it rest for 10 mins. The moisture let out by onions is enough to bind the mixture. Add the onion mixture in batches as shown in video. Flip it to ensure the pakoda is cooked evenly on both sides. Once the onion pakoda is crisp and golden, drain in kitchen tissue. 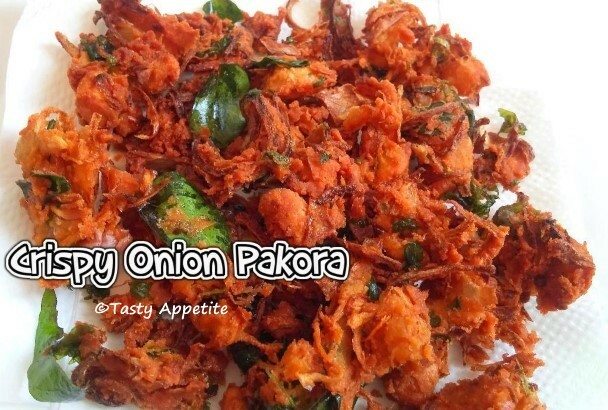 Crunchy, yummy onion pakoda is ready. It makes an irresistable snack along with hot cup of coffee or chai.